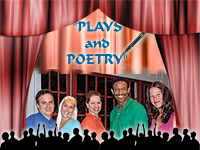 Fully developed 10 minute plays from established and new playwrights are interspersed with imaginative and diverse poems by 16 Connecticut poets. It will be an evening of thought provoking language presented by professional actors moving smoothly from dialogue to verse and back again. Between the 6 plays chosen from submissions from East Haddam to Australia, and the 20 poems by talented CT poets, there is something for everyone! We even have a world premier! Come laugh, ponder and reflect with us during an evening of engaging acting and spoken-word theatre. Los Angeles CA What can happen... or not, when you hesitate in romance? Belvidere IL Two actors lament their really bad performances in Waiting for Godot. Have fun watching as fingers point and egos deflate in this wide- awake actor's nightmare! General Seating $20, Seniors $18, Tickets at the door, Cash/Check Only. Please note that 25% of the East Haddam Historical Society ticket sales will go directly to the Historical Society as a donation and 25% of the Marlborough ticket sales will go directly to the Marlborough Arts Center.